Satellite image showing the inner core of the Hudson River estuary and main waterways of Port of New York and New Jersey. The Hudson Waterfront is situated on the peninsula between the Hudson and Hackensack Rivers, and their bays. The municipalities comprising the Hudson Waterfront are Bayonne, Jersey City, Hoboken, Union City, Weehawken, West New York, Guttenberg and North Bergen in Hudson County and Fairview, Cliffside Park, Edgewater and Fort Lee in Bergen County. 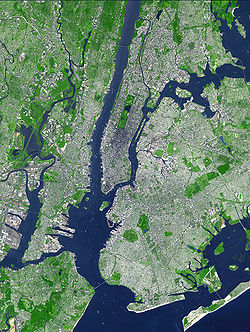 To the east, lies the New York City boroughs of Manhattan and Brooklyn, to the south Staten Island, to the west Newark Bay and the New Jersey Meadowlands, and to the north Palisades Interstate Park. The Hudson River Waterfront Walkway, which includes sections of the East Coast Greenway, travels along the Hudson River. NASA image of the lower Hudson, still called the North River in maritime usage. With a combined population of approximately 683,470 (2015 estimate) the Hudson Waterfront, if incorporated into a single city, would be the nineteenth most populous in the country with one of the smallest land areas of 35.7 square miles (92 km2). Its communities have some of the highest residential densities in the United States. Of municipalities in the United States over 50,000 people, Union City is the most densely populated. Guttenberg, although one of the smallest municipalities, stretching from 68th Street to 71st Street at 128 acres (0.52 km2), is the most densely populated "town" in the country. Many others are on the list of most densely populated places in the United States. The region is very ethnically diverse. Jersey City is the "most diverse" city in the United States. Six municipalities are on the list of the 100 cities (with a population over 5,000) with the highest percent of foreign-born residents: West New York (65.2%), Union City (58.7%), Palisades Park (57.0%) Guttenberg (48.7%), Fairview (48.4%) and Fort Lee (44.7%). North Hudson has the second-largest Cuban American population in the United States after Miami. West New York, North Bergen, Union City, Guttenberg and Weehawken have Cuban American populations between 8.75% (Weehawken) and 19.64% (West New York). Another large immigrant group is the Korean American community, near the GWB Plaza – and represents over half of the state's entire Korean population. Nearby Palisades Park boasts the highest percentage (36.38%) and total number (6,065) of Koreans among all municipalities in the state, while neighboring Fort Lee has the second largest cluster (5,978) and third highest proportion (17.18%)  Edgewater also has a significant Korean population. The commercial districts Palisades Park and Fort Lee, Cliffside Park, Edgewater, Fairview — collectively create a Koreatown Many in this community attend religious services at St Michaels in Union City. India Square in the Journal Square district is home to many from the country from which it takes its name. A large Filipino community is located nearby at Five Corners. The first Coptic Orthodox Church in the United States, St. Mark is one of many congregations in Jersey City and Bayonne. serving the growing Egyptian community. In many communities in the Hudson Waterfront English is not the first language spoken at home. Rail service includes New Jersey Transit's Hoboken Division: Main Line to Suffern (and in partnership with MTA/Metro-North, express service to Port Jervis), Bergen County Line, and Pascack Valley Line, all via Secaucus Junction (where transfer is possible to Northeast Corridor Line); Montclair-Boonton Line and Morris and Essex Lines (both via Newark Broad Street Station); North Jersey Coast Line (limited service as Waterfront Connection via Newark Penn Station to Long Branch and Bay Head); Raritan Valley Line (limited service via Newark Penn Station). All of these services stop at Hoboken Terminal. The Hudson-Bergen Light Rail: serves Bayonne, Liberty State Park, Jersey City's West Side, Downtown Jersey City, Hoboken Terminal, along the foot of the Palisades in Hoboken and Weehawken waterfront, Bergenline and Tonnelle Avenues. The PATH provides 24-hour subway service from Hoboken Terminal (HOB) and Downtown Jersey City and Journal Square (JSQ) to Midtown Manhattan (33rd), the World Trade Center (WTC), and Newark Penn Station (NWK). NY Waterway provides ferry service, from Jersey City, Hoboken and Weehawken Port Imperial and Edgewater Landing to Battery Park City Ferry Terminal and Wall Street in lower Manhattan, and to West Midtown Ferry Terminal, where free transfer is available to a variety of "loop" buses. Cape Liberty Cruise Port, opened in 2004, restored passenger ships service to the waterfront. New Jersey Transit as well as private companies provide bus service. Journal Square, Exchange Place, Hoboken Terminal, and Bergenline (HBLR) Station are major origination, destination and transfer points. Manhattan-bound bus service to the Port Authority Bus Terminal and George Washington Bridge Bus Station Local (and some suburban) service is identified by single or double digits: 1, 2, 22, 23, 64, 80, 81, 82, 83, 84, 85, 86, 87 and 88. Manhattan (with local stops) and some suburban service is identified by triple digits: 120, 121, 123, 125, 154, 156, 158, 159, 163, 165, 166, 168, 181 and 188. Newark Liberty Airport (EWR) is the closest international airport in New Jersey with scheduled passenger service. LaGuardia Airport (LGA) is in Flushing, Queens and John F. Kennedy Airport (JFK) is on Jamaica Bay in Queens. Teterboro Airport, in the Hackensack Meadowlands, serves private and corporate planes. Before the 17th century the region was populated by the Hackensack and Tappan, phratries of the Lenni-Lenape, an Algonquian people, who maintained semi-permanent and seasonal campsites throughout the diverse landscape. They are recalled throughout the region in countless places names. In 1609, Henry Hudson captained a sailing expedition for the Dutch West India Company which led to the establishment of the Dutch provincial colony of New Netherland, with its capital at New Amsterdam. During that exploration he laid anchor in the Upper New York Bay and Weehawken Coves. In 1630, land along the west bank of the river which bears his name was acquired and called Pavonia. Clusters of settlements were located at Communipaw, Harsimus, and Paulus Hook, and later at Hoboken, Pamrapo, Kewan/ Minkakwa, and Vriessendael. Some of the communities were compromised in conflicts with the indigenous population known as Kieft's War and the Peach Tree War. Director-General of New Netherland Peter Stuyvesant granted a charter in 1660 for a village at Bergen Square, considered the first autonoumous municipality in New Jersey. In 1664, four English frigates entered the Upper New York Bay, demanded, and peacefully received, control of Fort Amsterdam, and by extension, all of New Netherland. Bergen, New Netherland thus became part of the Province of New Jersey. In 1668, a charter was granted for the "Towne and Corporation of Bergen". In 1683, East Jersey was divided into four counties, the waterfront region keeping the name given by the New Netherlanders. Bergen encompassed the land between the North River and Hackensack River from Bergen Point north to the ambiguous New York-New Jersey state line For much of the 18th century the villages remained essentially agricultural and fishing communities, supplying the growing city of New York across the river, using ferries including those at Communipaw, Paulus Hook, Weehawken, Bulls Ferry and Burdett's Landing. It was during the colonial period that Newark Plank Road, Hackensack Plank Road and Paterson Plank Road, thoroughfares from the waterfront across the Meadowlands, were laid, and the area of the English Neighborhood was settled. In the American Revolutionary War the New York Harbor was under British control after Washington ordered the retreat from Fort Lee, though he gave instructions to "go to the Bergen heights, Weehawk, Hoebuck or other heights to observe the motions of the enemy's shipping" and gather any other possible intelligence. The attack of British garrison at Paulus Hook was seen as a victory for American forces. Urbanization of the area began in the early 19th century with City of Jersey and the development of Hoboken, Weehawken, and Edgewater as summer resorts. While some districts were laid out in urban grid, others developed more randomly following coach and ferry roads, or drives leading to larger estates or farms. Weehawken was the site for 18 known duels between 1700 and 1845, including that of the Burr-Hamilton duel in 1804. In 1811, Colonol John Stevens' ship the Juliana, began operation as the first steam-powered ferry service was between Manhattan and Hoboken, which can claim to be the birthplace of baseball The first officially recorded game of baseball in US history took place in Elysian Fields in 1846. During the latter half of the 19th and early part of the 20th centuries, the area experienced intense growth. German immigration to the United States after 1848 gave the parts of the region a distinctly German flavor,particularly Hoboken which became major port for the Hamburg America Line, and North Hudson with the development of breweries and the embroidery industry. Many railroad terminals and maritime facilities built there. Many immigrants to the USA arrived, first via Castle Clinton and later via Ellis Island. The development of the ports resulted in intense shipping and industrial development along the shore, and residential development further inland. Blasting of the Palisades and landfilling along the water's edge considerably changed the landscape. Rail and trolley car lines were laid, some overland, while others traversed cuts or tunnels. Before the construction, in 1910, of the Pennsylvania Railroad's North River Tunnels under the Hudson, railroads terminated on the west bank of the river, requiring passengers and cargo to travel by ferry or barge to Manhattan. That year, the Hudson and Manhattan Railroad, forerunner of the PATH system, was opened as a partially successful attempt to connect all the rail stations (as well as those in Manhattan) with a mass transit system. The only remaining station in operation is Hoboken Terminal which serves as a terminus for many New Jersey Transit commuter trains. The restored Communipaw Terminal is a prominent waterfront landmark. Upon entry to World War I the US government took the Hamburg-American Line piers in Hoboken under eminent domain, and which became the major point of embarkation for more than three million soldiers, known as "doughboys". In 1916, an act of sabotage literally and figuratively shook the region when German agents set off bombs at the munitions depot in New York Bay at Black Tom. The fore-runner of Port Authority of New York and New Jersey was established on April 30, 1921. Huge transportation projects opened between the wars: The Holland Tunnel in 1927, The Bayonne Bridge in 1931, and The Lincoln Tunnel in 1937, allowing vehicular travel between New Jersey and New York City to bypass the waterfront. Hackensack River crossings, notably the Pulaski Skyway, were also built. 125th Street Hudson River bridge never got beyond planning stages. In 1946, the baseball color line was first crossed at Roosevelt Stadium by Jackie Robinson. Among the many companies who had a presence along the waterfront were Colgate-Palmolive, Standard Oil, Port Johnston Coal Docks, Central Railroad of New Jersey, Lipton Tea, Maxwell House, Bethlehem Steel, Hamburg-American Line, Ford Motor Company, Lever Brothers, and Archer-Daniels-Midland Military Ocean Terminal at Bayonne opened in during World War II. By the 1970s most traditional industries in the region had been abandoned and the waterfront has been being redeveloped for recreational, residential, and commercial use. After the closing of Palisades Amusement Park in 1971, large residential highrises were built to replace it. Other highrise towers were constructed throughout the area which is still characterized by one and two family homes and low-rise apartment buildings. Liberty State Park opened to coincide with the United States Bicentennial in 1776. Gentrification of Hoboken and Downtown Jersey City's 19th century districts began.[when?] NY Waterway restored ferry service across the Hudson in 1986. Begun in the 1980s. Since the 1990s the Hudson Waterfront has experienced intensive development, consisting largely of high-density residential buildings, office towers, and retail centers. Some of this development is on brownfields that were once factories, warehouses, docks, and rail yards, particularly in areas along public transportation corridors. It has been called the Gold Coast, a relatively new term coined by real estate agents, brokers, and developers in the 1980s, who realized the investment potential of the area. The name is infrequently used outside the context of real-estate sales and marketing. Other residential development is being constructed as single-family housing, multi-family apartments, and condominiums. Access to the Hudson–Bergen Light Rail has spurred much development. The yet unbuilt Northern Branch is planned for a route on the west side of the Palisades. The Hudson River Waterfront Walkway has been constructed to provide contiguous public access to the water's edge with an 18.5-mile (29.8 km) pedestrian promenade. ^ "The 10 most cramped towns in New Jersey". NJ.com. February 2017. Archived from the original on October 24, 2017. Retrieved October 23, 2017. ^ "Jersey City regains title as most diverse city in U.S.: study". nj.com. Archived from the original on 28 February 2017. Retrieved 26 April 2018. ^ "Jersey City named most diverse city in America: report". nj.com. Retrieved 26 April 2018. ^ Stolarik, Mark M. Forgotten Doors: The Other Ports of Entry to the United States. Bach Institute Press, 1988, Page 100. ^ Profile of General Demographic Characteristics for Bergen County, New Jersey: 2000. Archived 2008-12-02 at the Wayback Machine U.S. Census Bureau. Retrieved on March 17, 2007. ^ Profile of General Demographic Characteristics for Palisades Park borough, New Jersey: 2000 Archived 2007-12-06 at the Wayback Machine, U.S. Census Bureau. Retrieved on March 17, 2007. ^ a b c Korean Ancestry by City Archived 2007-12-06 at the Wayback Machine. Retrieved on March 17, 2007. ^ Profile of General Demographic Characteristics for Fort Lee borough, New Jersey: 2000 Archived 2007-12-06 at the Wayback Machine, U.S. Census Bureau. Retrieved on March 17, 2007. ^ Coyne, Kevin (February 17, 2008). "Where Church Pews Replaced the Bar Stools". The New York Times. Archived from the original on October 24, 2017. Retrieved May 8, 2008. ^ Elliott, Andrea (January 21, 2005). "A Bloody Crime in New Jersey Divides Egyptians". The New York Times. ^ "The 44 N.J. towns where English is not the dominant language". Retrieved January 10, 2017. ^ Russell Shorto, The Island at the Center of the World: The Epic Story of Dutch Manhattan and the Forgotten Colony that Shaped America ISBN 0-385-50349-0 (New York, Doubleday, 2004). ^ "Hudson Co. NJ — History — Formation of Bergen and Hudson Counties". Rootsweb.ancestry.com. Archived from the original on 2011-05-19. Retrieved 2008-11-01. ^ * Sullivan, Dean (1997). Early Innings: A Documentary History of Baseball, 1825–1908. U of Nebraska Press. ISBN 0-8032-9244-9. OCLC 36258074. ^ "The Top Of The Palisades. ; Along The New-Jersey Shore. From Weehawken Up The Hudson-The Vandal Hand Of Progress-The Old Duel Ground Battle Sites The Block-House And Fort Lee-Opposite Yonkers. Gov. Alvord As A Legislator The Goddess Of Liberty Calls On The President. What Is Called An Accident A New Party In Vermont. The Lee Monument In New-Orleans. New-York Boys In Virginia" (PDF). The New York Times. May 19, 1878. Archived (PDF) from the original on November 11, 2012. ^ "Taxing A Water Front; The Value Of The Jersey Central's Terminal Lands.How The Experts Arrived At Their Figures--Mr. Harrison's Researches Into Jersey City's Harbor" (PDF). The New York Times. May 18, 1885. Archived (PDF) from the original on November 11, 2012. ^ Black Tom Info from New Jersey City University Archived 2011-02-03 at WebCite Accessed May 6, 2009. ^ Fowler, Glenn (January 20, 1971). "Palisades Park Expected To Close After Season". New York Times. Archived from the original on October 19, 2012. Retrieved 2009-01-27. Palisades Amusement Park, one of the last of the playgrounds that once dotted the outer reaches of the city and the nearby suburbs, may close after the 1971 season. ^ Cheslow, Jerry (October 9, 2005). "Blending Two Cities into One". New York Times. Retrieved 2011-01-31. ^ "BELOW THE PALISADES, A RICH POTENTIAL". The New York Times. 26 September 1982. Archived from the original on 11 May 2017. Retrieved 10 January 2017. ^ "New Jersey Gold Coast Regional Chamber of Commerce – Bringing Together Businesses, People & Resources". Archived from the original on 11 November 2016. Retrieved 10 January 2017. ^ "Development on Jersey's Hudson River shoreline has been a bumpy ride, but the results are often impressive". 11 February 2009. Retrieved 10 January 2017. ^ Jacobs, Andrew (March 29, 2000). "Seeing the Future in an Old Triumph: Trolleys". The New York Times. ^ Kannapell, Andrea (February 15, 1998). "On the Waterfront". The New York Times. Archived from the original on March 5, 2016. RIVER ROAD/HUDSON WATERFRONT CIRCULATION STUDY HUDSON AND BERGEN COUNTIES (Report). North Jersey Transportation Planning Authority. June 2009. Retrieved October 4, 2013. River Road/Hudson Waterfront Corridor Strategy: A Phase Two Study (Report). North Jersey Transportation Planning Authority. June 2013. Retrieved October 4, 2013. This page was last edited on 19 February 2019, at 16:19 (UTC).